One of the most annoying things about PDF files are their margins, the only real way of getting a better view at the text is to zoom the whole page in. It’s a way of getting more info to screen by removing the wasted white space around the body of the file for each page, this really comes in useful when displaying PDF files on your Kindle, Nook, Sony Reader, Smart Phone or other eBook Readers. If you have a Kindle 3 (the one with the 6″ screen) and you love it. Except that reading most PDF ebooks and documents on Kindle 3 is rather annoying and can be downright impossible, with unreadable, miniscule text and lots of wasted white space in the margins. 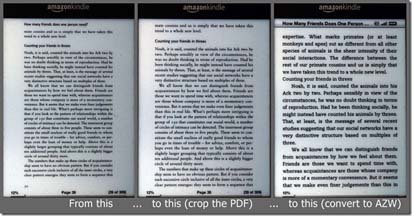 This is the case because the Kindle 3 attempts to display each page of a PDF document fully on its 6″ screen, and the zoom function seems like it was purposely designed to be as unpractical and un-user-friendly as possible, segmenting your PDF pages into strange quadrants that make reading a chore. In this case, I am suggesting that the best way to read a PDF on a Kindle 3 involves cropping it first, so that the white space in the margin as well as page numbers and any text in the header and footer is removed. This process can create a PDF that is perfectly readable on the 6″ screen. That you do not need the white margin around the text when you are reading it on a Kindle. That you do not need the headers and footers when you are reading it on a Kindle. Why do we crop the PDF file but not convert PDF file to other formats? You may be asking why bother cropping a PDF rather than simply converting to another format. The answer to this is that such conversions usually result in text in the header/footer and page numbers being strewn about your ebook as artifacts that interrupt the text and make for a very unpleasant experience. By the PDF Margin Crop product, you can produce a continuous ebook with a much better and more natural reading experience. You can use VeryDOC PDF Margin Crop product to crop or cut the margins from PDF documents, PDF Margin Crop is able to calculate distance of margins and cut them automatically, you needn't set the value of margins by manual, it can be used easier than most similar products in the market. Also, PDF Margin Crop product does support all type of PDF files, include MS Word generated PDF files and scanned PDF files. You can find this article by lots of keywords, such as: cropping pdf for kindle 3, kindle 3 pdf cut, kindle 3 pdf crop, kindle 3 pdf margin, cut kindle margins, kindle 3 software, kindle crop margin, etc. In short, VeryDOC PDF Margin Crop product is very good, it will help you to improve the reading experience on kindle.